Peer counseling is so powerful because hearing from someone close in age to us and who shares similar experiences allows us to relate much easier. 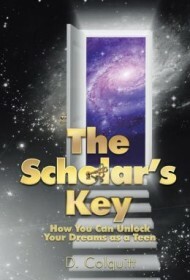 In The Scholar’s Key, author Donovan Colquitt hopes to inspire other teenagers to apply for, and win, college scholarships. Inspired in part by a friend who died too young, its “carpe diem” spirit is a major strength. Colquitt graduated high school in the top 1% of his class with a GPA above 4.0. He won more than $250,000 in college money through dogged persistence, keeping his grades up, volunteering, squeezing in a long list of extracurricular activities, and applying to any and all possible funding sources. That in itself is a sound lesson in how to succeed and reason to be proud. Readers who click with Colquitt’s chatty style will appreciate his anecdotes about getting organized and changing one’s mindset to tackle more challenging classes or outside projects. It’s also nice to see someone so young excel, and the author’s story may motivate readers who are of a similar age. All told, however, The Scholar’s Key lacks the depth and focus it needs to be fully useful.